"The book's strengths include its ability to explain in plain language the beauty of economic theory; the concise manner in which real world examples are integrated into the text; and, the online assistance that does an effective job in complementing the text." "The books strengths include its ability to explain in plain language the beauty of economic theory; the concise manner in which real world examples are integrated into the text; and, the online assistance that does an effective job in complementing the text." "The bookas strengths include its ability to explain in plain language the beauty of economic theory; the concise manner in which real world examples are integrated into the text; and, the online assistance that does an effective job in complementing the text." "I think that the greatest strengths are that it is clear (written in a student-friendly language), relatively concise, and provides a good coverage of what I think students need to know about principles of economics. I think that the style of the text is personable and is easy for students to read without being condescending. In terms of the coverage, as I noted above, we cover the entire text in my one-semester class, and cover just about exactly the entire text - no more, and only a little (two chapters) less." "I find navigation process very simple. I am very impressed with Meet your tutor - Master the Learning Objectives section (that is so well planned out and organized). If students are having problems with any of the material and they're serious about being successful in this class, it is impossible for them not to understand the material after doing suggested activities in this section. "Ask the Author" video clips are interesting and clever. "Economic Applications" section also has good navigation system and can be useful for teachers and students both." Mankiw's Principles of Economics textbooks continue to be the most popular and widely used text in the economics classroom. 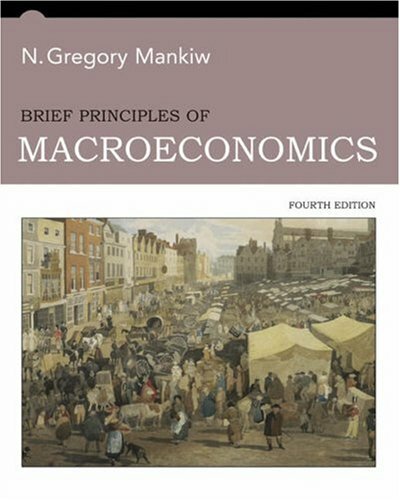 BRIEF PRINCIPLES OF MACROECONOMICS, 4th Edition features a strong revision of content in all 18 chapters while maintaining the clear and accessible writing style that is the hallmark of the highly respected author. The 4th edition also features an expanded instructor's resource package designed to assist instructors in course planning and classroom presentation and full integration of content with Aplia, the leading online Economics education program. In the 4th edition Greg Mankiw has created a full educational program for students and instructors -- Experience Mankiw 4th edition. "I have tried to put myself in the position of someone seeing economics for the first time. My goal is to emphasize the material that students should and do find interesting about the study of the economy." - N. Gregory Mankiw.